An innovative program launched at UF Health that is improving patient outcomes through pharmacogenetic testing has been recognized with a 2018 Finalist Award for Excellence in Patient Safety by the American Society of Health-System Pharmacists, or ASHP, Foundation. UF Health’s Precision Medicine Program received the award Dec. 2 at the ASHP Midyear Clinical Meeting in Anaheim, California. Since its inception in 2011, the Precision Medicine Program has led the launch of genetic testing to assist doctors with prescribing safer and more effective medications for their patients, contributed to a growing evidence base in support of genotype-guided therapy and developed multiple education programs that are training current and future providers in precision medicine. The program has addressed several patient safety initiatives at UF Health by improving patient outcomes through better-informed medication prescribing and reducing adverse drug effects. More than 4,600 clinical pharmacogenomics tests have been ordered at UF Health hospitals in Gainesville and Jacksonville. Testing currently extends from patients in primary care to cardiology, psychiatry, surgery and other health services. Recent efforts have expanded testing outside UF Health, as the program has partnered with Moffitt Cancer Center in Tampa, the OneFlorida Clinical Research Consortium in Orlando and Nemours Children’s Health System to help facilitate implementation of pharmacogenetics testing in their health system. Created in 2004 as a collaboration between the ASHP Foundation and Cardinal Health, the Award for Excellence in Medication Safety is a nationally acclaimed award program that recognizes a pharmacist-led inter-professional team for its significant system-wide improvements relating to medication use with demonstrated patient and organizational outcomes. 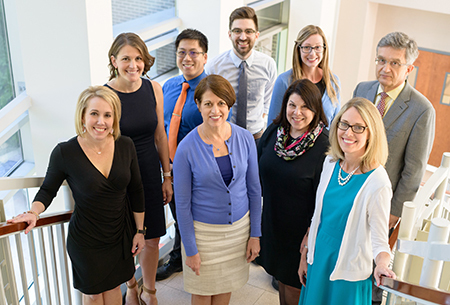 The award is the only national honor that recognizes a pharmacist-led interprofessional team for implementing significant system-wide improvements related to medication safety in a hospital or health system.